The story of the men and women who drove the Voyager spacecraft mission-- told by a scientist who was there from the beginning. The Voyager spacecraft are our farthest-flung emissaries--11.3 billion miles away from the crew who built and still operate them, decades since their launch. Voyager 1 left the solar system in 2012; its sister craft, Voyager 2, will do so in 2015. The fantastic journey began in 1977, before the first episode of Cosmos aired. The mission was planned as a grand tour beyond the moon; beyond Mars, Jupiter, and Saturn; and maybe even into interstellar space. The fact that it actually happened makes this humanity's greatest space mission. 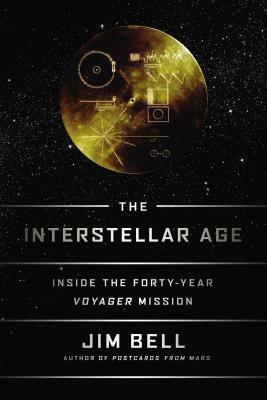 In The Interstellar Age, award-winning planetary scientist Jim Bell reveals what drove and continues to drive the members of this extraordinary team, including Ed Stone, Voyager's chief scientist and the one-time head of NASA's Jet Propulsion Lab; Charley Kohlhase, an orbital dynamics engineer who helped to design many of the critical slingshot maneuvers around planets that enabled the Voyagers to travel so far; and the geologist whose Earth-bound experience would prove of little help in interpreting the strange new landscapes revealed in the Voyagers' astoundingly clear images of moons and planets. Speeding through space at a mind-bending eleven miles a second, Voyager 1 is now beyond our solar system's planets. It carries with it artifacts of human civilization. By the time Voyager passes its first star in about 40,000 years, the gold record on the spacecraft, containing various music and images including Chuck Berry's "Johnny B. Goode," will still be playable. Jim Bell is currently a professor in the School of Earth and Space Exploration at Arizona State University, an adjunct professor in the Department of Astronomy at Cornell University, and president of The Planetary Society. He and teammates have received more than a dozen NASA Group Achievement Awards for work on space missions, and he was the recipient of the 2011 Carl Sagan Medal from the American Astronomical Society, for excellence in public communication in planetary sciences. He is a frequent contributor to popular astronomy and science magazines like Sky & Telescope, Astronomy, and Scientific American, and to radio shows and internet blogs about astronomy and space. He has appeared on television on the NBC Today show, on CNN's This American Morning, on the PBS NewsHour, and on the Discovery, National Geographic, Wall St. Journal, and History Channels. He is the author of Postcards from Mars.